Invest 94L over the western Caribbean Sea will move west and in to Central America by tomorrow with minimal development expected. However, it is likely to bring heavy rain and the threat of flooding to the region. Now that hurricane Michael has left a legacy that will be remembered for generations to come, the tropics are hopefully going to give us a much needed period of rest. 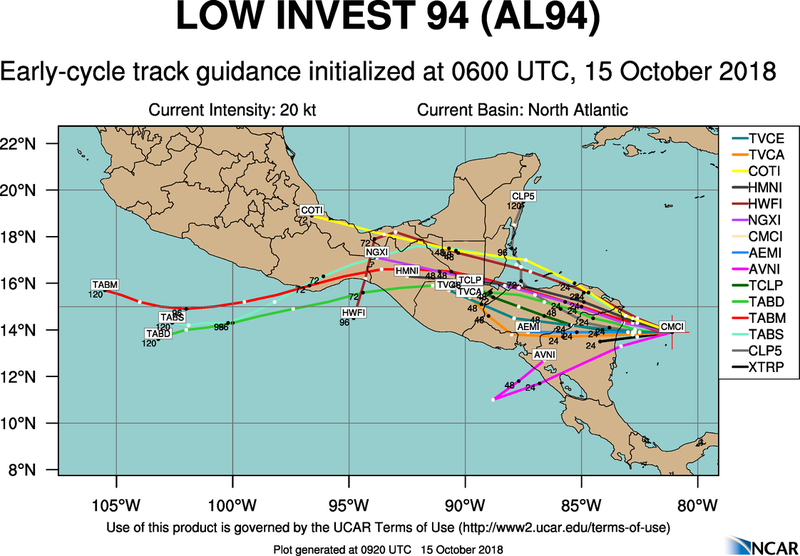 We do have an area to watch, however, in the climatologically favored western Caribbean Sea – invest 94L. The NHC indicates that it might become a tropical depression before eventually moving in to Central America tomorrow. The main threat here will be heavy rain which can lead to mudslides, flash floods and loss of life. Otherwise, I see nothing within the long term models to suggest any upticks in activity for the Atlantic Basin over the coming week to 10 days. On another note, I am back home in Wilmington, NC after an indescribable experience in Mexico Beach, Florida as part of the historic event that unfolded across the region with hurricane Michael. I have an incredible amount of data and video that will be used to unlock some of the secrets of this unprecedented hurricane. It will take time to process it all but rest assured, I am working on it. There is much to learn and through the use of technology, I was able to capture never-before-seen HD video of violent wind, storm surge and the immediate aftermath at point blank range. This will be very important in terms of what we see and discover about the inner core of an intense hurricane. I will keep you posted as I extract the science from the video. I also want to express my gratitude to all that helped me get through this harrowing experience. My success is your success – we did it together. Whether it was the financial support to make things possible with funding needs or back-end help to ensure the site and our app worked flawlessly; it all mattered and made for the most successful field mission of my career. Thank you. Tagged hurricane Michael, Mexico Beach. Bookmark the permalink.